... 1981, María Luisa Arcelay (below left) died of a heart attack 87 years after she'd been born in Mayagüez, Puerto Rico. (photo credit) She worked initially as a schoolteacher, and then became a businesswoman, operating needlework shops on the island. She spoke out for the rights of Puerto Rican women there and in New York, and founded a civic and cultural club for women in Mayagüez. 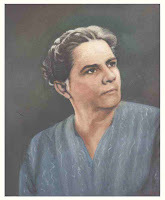 In 1932 -- the same year "literate women were allowed to vote" in Puerto Rico -- Arcelay was elected the 1st woman legislator in Latin America. In April 1933 her new colleagues marked her achievement by passing a resolution in her honor and inviting her to preside over the parliamentary proceedings.